The International Trade Union Confederation (ITUC) and the European Trade Union Confederation (ETUC) have welcomed the entry into force of the Council of Europe Convention on Action Against Trafficking in Human Beings. The Convention becomes legally binding on the first ten countries to have ratified it (Albania, Austria, Bulgaria, Croatia, Cyprus, Denmark, Georgia, Moldova, Romania and Slovakia), on 1 February, with Bosnia-Herzegovina, France and Norway following on 1 May. Most European countries have taken the first steps to ratify the Convention, with the UK having already announced its intention to complete the ratification by the end of 2008. “Human trafficking is an appalling reality which exists in much of Europe. Putting this Convention into place, alongside the relevant International Labour Organisation Conventions, will help ensure that Europe plays its part in tackling this worldwide scourge. It is the first legally binding European instrument on this issue”, said John Monks, General Secretary of the ETUC and of the ITUC’s Pan-European Regional Council (PERC). Trade union organisations throughout Europe are active in the fight against human trafficking, and will form part of a Global Trade Union Alliance to combat forced labour and human trafficking. 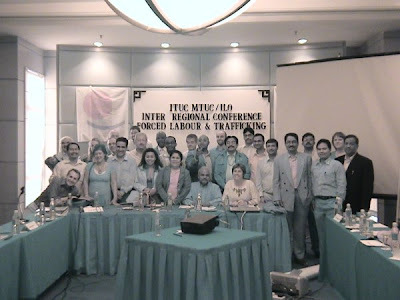 The alliance is being established by the ITUC with support from the International Labour Organisation (ILO). The ILO estimates that some 2.45 million people, most of them women and children, are victims of trafficking around the world. Around 43% of the total are trapped in commercial sexual exploitation, while around one-third are exploited in agriculture, sweatshops and private households. “Our global alliance against forced labour and trafficking will mobilise increased trade union action around the world against this form of modern-day slavery”, said Ryder. Yes, the Council of Europe Convention on Action Against Human Trafficking has come into force now. Ukraine has still not ratified it. And as far as my research has shown me, it may still be a while before they are able to reach the point of ratification. A big hurdle Ukraine will have to overcome in order to ratify and meet the requirements of the Convention has to do with the protection of victims during and after the court process. A recent meeting with a representative of the Supreme Court of Ukraine revealed that things like witness and victim intimidation as well as the risks the victim is exposed to during the investigation are huge factors as to why victims often will not follow through with testifying and ultimately the traffickers end up not being prosecuted under anti-trafficking law. The CoE Convention will require all of that to change, which will require effort and funds from the government and law enforcement. The IOM has been working on joint projects to improve this situation for victims. As far as trade unions are concerned,up until recently, they were not taking part in anti-trafficking activity (See page 43-44). This situation has improved a bit, but only a select few in Ukraine cooperate with intergovernmental and nongovernmental organizations in the country to contribute to the fight against human trafficking: the Federation of Trade Unions of Ukraine, the Confederation of Free Trade Unions of Ukraine, among a couple others. IPEC has stated that this situation has improved over the last couple of years, and the involvement of trade unions is important for building a union-employer-government network to address the issue. By the way, I am very excited to report that I will be attending the UN GIFT Vienna Forum in two weeks. I will be sure to update the site with information from the conference so please make sure to keep re-visiting the site!